My friend Taryn (also know as @missladyfinger) and I joined forces again to create an April showers cake and nail art look. We were inspired by all the rain we’ve been getting in New York lately, and wanted that to be the inspiration of this collab! Taryn painted an amazing rainy design on our nails, and I made a cake with blue swirled layers, blue ganache rain drops, and buttercream flowers. The full recipe can be found below, and the full tutorial can be seen here. Preheat oven to 350°F. Grease and line four 8” round pans. Divide evenly between three bowls. Leave one white, and color one light blue (2 drops blue gel food coloring), and one a royal blue (6-8 drops blue gel food coloring). Add batter to pans 1/2 a cup at a time, alternating colors. Once all batter has been used, draga knife through the batter to create a swirled batter. Bake for 35 minutes, or until a skewer comes out clean. Allow to cool for 10 minutes, then run an offset spatula around perimeter of the pan to separate the cake from the pan. Place cake layers on a rack to finish cooling. As the cake layers bake, prepare the white chocolate ganache and frosting! The full recipe and instructions can be found here. Be sure to color it with a couple drops of blue gel food coloring. To make the frosting, beat the butter on high for 30 seconds, until smooth. Slowly add in the powdered sugar, 1 cup at a time. Alternate with small splashes of cream. Once fully mixed, add in the vanilla and salt, and beat on medium low until the ingredients are fully incorporated, and the desired consistency is reached. If the frosting is too thick, add in cream (1 teaspoon at a time). If the frosting is too thin, add in more powdered sugar (quarter of a cup at a time). Add 1/3 cup of frosting into eight different bowls. Color each bowl the following shades: blue, violet, yellow, orange, red, and three ombre shades of green. Place frosting into pipe bags, cut with a 1 cm opening. Set aside another cup of uncolored frosting, and add to a piping bag with a 1.5 cm opening. 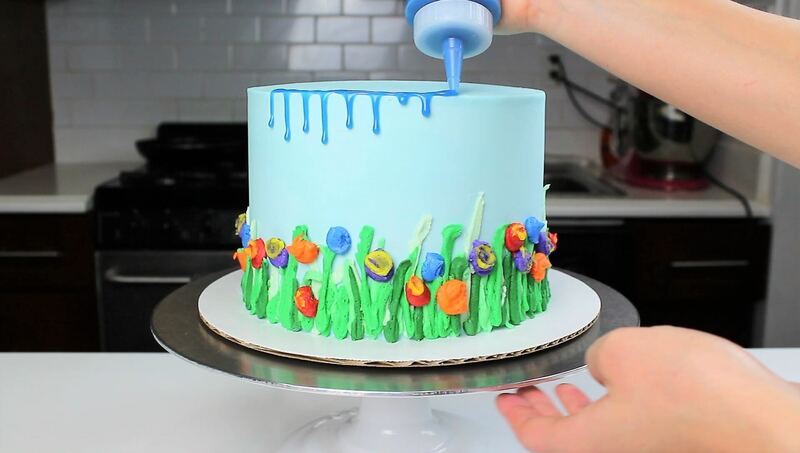 Color the remaining frosting light blue with gel food coloring. 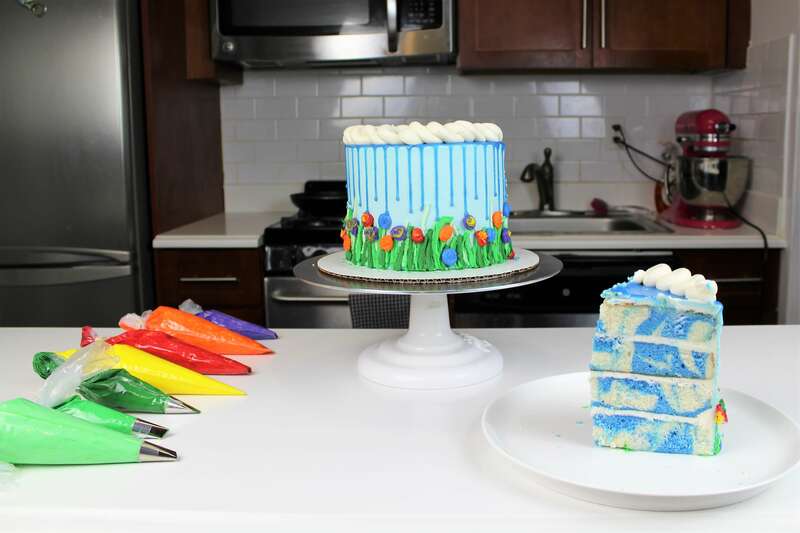 To assemble the cake, stack cake layers and apply an even layer of light blue buttercream between each layer. Once stacked, apply a thin crumb coat to the cake, and chill the cake in the freezer for 5 minutes to allow the crumb coat to firm up. Then apply a thicker, second layer of buttercream, and smooth with a cake bench. Using the shades of green frosting, make vertical lines between 1-3 inches all around the cake, angling some slightly to both sides. This will be the grass, so you want it to look as random and organic as possible. 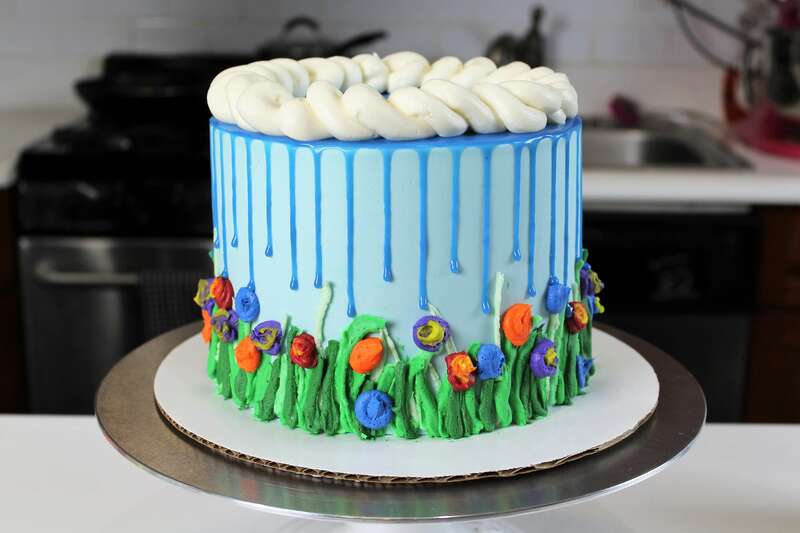 Next, using the remaining colored buttercream, pipe small circles along the top of the grass line to create the flowers. Add some yellow into the center of some of the flowers to give them more depth. Place in the freezer again for 15 minutes. This step is CRUCIAL, as the cake must be chilled before adding the blue ganache drips. Once thoroughly chilled, slowly add the blue ganache drips onto the cake. 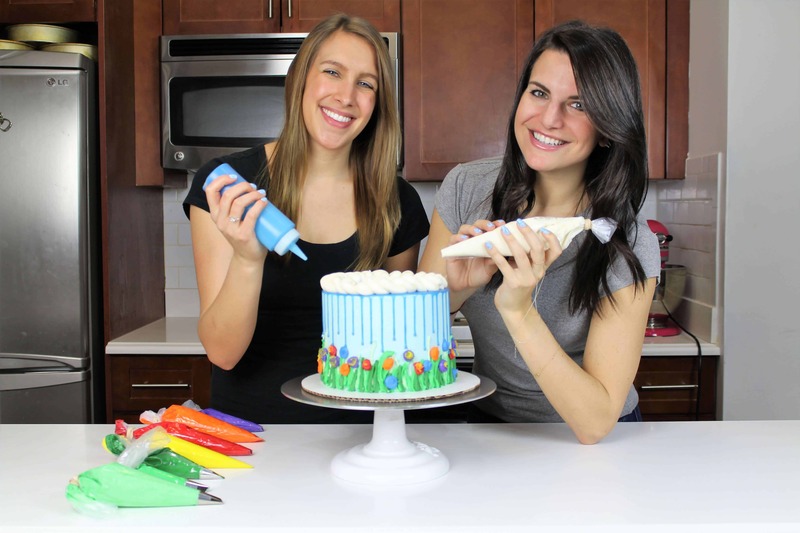 You can see a full tutorial on how to add drips to a cake here. Place in the freezer for another 10 minutes to help the drips set. Can you easily half the cake recipe? Cupcakes? Is this recipe easy to make cupcakes with? No! This cake recipe bakes really flat, to make perfect layers for stacking. It therefore also makes extremely flat cupcakes. I have a different vanilla cupcake recipe up that I recommend instead! Do you use all-purpose flour? I had so much fun making this! Thank you for sharing your recipe! This is such a pretty cake. I am going to try it but modified for a baby shower (boy). Would it make a difference if I used whole eggs instead of just egg whites? I’ve made it a few times now and absolutely love it but I’m wasting lots of eggs! Can i make this with handmixer in a wire whisk? I don’t have a standmixer with paddle attachment though. Hope to hear from you. Love your cakes! ????? hearts from P.I. ? I’m gluten free, and I’ve been following your wonderful cake recipes for a few months now. I’m curious to if I could easily switch out the flour for a cup for cup gluten free flour. Why do you use egg whites only? It’s a somewhat dense cake, and egg whites help make it a bit lighter! I use egg whites from the carton. It’s way easier, and that way I don’t have to waste yolks! I loved the flowers and the grass on the sides of the cake. I used it on a cake I made. I wish I could share a pic here but I can’t figure out how.